If you start to see any kind of liquid dripping from your air conditioner, you should call for repairs as soon as you can. That might be a refrigerant leak, which is a serious threat to the health of the system. Refrigerant is the liquid that air conditioners rely on to cool the air. The output capacity of the air conditioner will fall along with the refrigerant level in the system, until it eventually breaks down entirely. Make sure you call for repairs before that happens. Short cycling is when your air conditioner turns on and off every few minutes instead of completing a cooling cycle. It’s usually caused by an electrical issue, and it creates a number of significant problems for the air conditioner. First, it prevents the system from cooling the home, since it can’t complete a full cooling cycle. Second, it increases the wear and tear the system suffers in a short period of time. The longer the air conditioner short cycles, the more prone to developing problems the system will be. If the issue isn’t dealt with in time, it could result in the entire system needing replacement. Ice forming on your air conditioner is a bad sign. The system typically freezes over when there isn’t enough air moving across the evaporator coil, either because the air filter is clogged or the air handler isn’t working properly. This causes the condensate on the coil to freeze. A frozen air conditioner coil won’t have access to the air around it, and so won’t be able to siphon heat out of the air to cool the home. The ice can cause other issues as well, like allowing liquid refrigerant to make it into the compressor and break it. The ice can spread down the refrigerant line to other parts of the air conditioner, causing further malfunctions and costly repair needs. If you have ice on your air conditioner, make sure you call a professional technician to take a look at it as soon as possible. If you need air conditioning repair services of any kind, contact us today to schedule an appointment with one of our professional technicians. We’ll make sure that your air conditioner finishes the summer in the best possible condition. 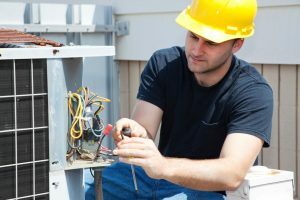 The A/C Guy of Tampa Bay Inc. provides a full range of air conditioning repair services in Tampa, FL.